If you want to see a normally unflappable Parisian go into a little bit of a crazed frenzy, you don’t need to watch their reaction to me mercilessly butcher their beautiful language. One just needs to utter a single word — cheesecake. As soon as I took the cream cheese out of the refrigerator this morning, my French other-half started circling the kitchen counter, to see what was up. I’ve never met a French person whose face didn’t soften and melt at the mere utterance of the word, and le cheesecake is always spoken of with a reverence normally reserved for the finest French cheeses and most exclusive wines. Just as popular as cheesecake has become in France, cream cheese is equally popular and is now widely available, called fromage à tartiner – or “spreading cheese.” I decide to combine the two with another popular baked good on both sides of the Atlantic, brownies, wanting to show how marvelously the creamy topping melded with rich, deep-dark brownies, in one luscious, swirly bar. These were a big hit and I had trouble keeping them around. Thankfully I stored a few in the freezer for myself, so I have a stash for the future. Am not sure if French people are ready to enjoy brownies straight out of the freezer, but that’s okay, because I won’t feel so bad about not sharing all of them. Adapted from Ready for Dessert (Ten Speed)For those of you who like higher brownies, use an 8-inch (20cm) pan. 3. In a medium saucepan, to make the brownie batter, melt the butter and chocolate over low heat, stirring until smooth. Remove from heat and beat in the 2/3 cup (130g) sugar, then the eggs. 5. In a separate bowl for the cheesecake topping, beat together the cream cheese, the yolk, 5 tablespoons (75g) of sugar, and vanilla until smooth. 6. Distribute the cream cheese mixture in eight dollops across the top of the brownie mixture, then take a dull knife or spatula and swirl the cream cheese mixture with the chocolate batter. Rap the pan on a countertop a few times to let the batter and swirl settle together. 7. Bake until the batter in the center of the pan feels just set, 35 to 40 minutes. Let cool, then lift the brownies out holding the foil and peel it away. Cut the brownies into squares. Storage: These cheesecake brownies will keep in an airtight container for a couple of days. They also freeze well for up to two months. I recommend freezing them individually so you can remove them one at a time. How interesting that two desserts that I usually categorize as North American favs, are so popular in France. I’d think they’d be in rapture about their own delectable pastry classics. Great looking brownies by the way! Your Cheesecake Brownies look great! Yes, here (Switzerland) cream cheese is expensive like hell (28 CHF for a cheesecake)! Incredible! Those brownies look too delectable not to make! Where do you stock up on American food in Paris? Thanks for all of the great posts and inspiration, have a safe trip. I believe petit suisse can substitute for cream cheese in cake recipes. Also, it is fairly affordable in the European Francophone region. The petit suisse is fairly comparable in fat content to American cream cheese. Do Ricotta cheesecakes go over as well in France as the American-style cream cheese ones? I’d think ricotta cheese would be more affordable, and while the texture is different, might satisfy a cheesecake craving. Great looking brownies. i am always on the look out for a new brownie recipe as my kids all love to eat em. I have a catering and american baked goods business here in Paris and cheesecake is in high demand. I have tried everything and have very good results using Carre Frais (Elle&Vire). The fat content is the same as philidelphia and the taste is almost the same. Not quite as silky as its American counterpart but close. Your baking and creativity inspires me. I love your writing and pictures. These brownies look amazing, I love cheesecake and chocolate! Michelle: That’s a good idea, except I think I’d eat all the Petit Suisse I bought first! Maureen: I’ve used the Franprix brand with decent results. But it’s funny that Philly is so expensive in France. It’s much cheaper in Italy and Belgium, and it’s even made in Europe (I think.) I guess it’s supply & demand? De: I’ve never seen a ricotta cheesecake here. But I don’t think they’d go over as well. I like ricotta cheesecakes, but they’re usually not smooth and unctuous, and swoon-worthy. Which the French are attracted to…and me too! FYI, Philadelphia cream cheese is widely available in the UK. You could bring back a rucksack-full on the Eurostar if you wanted. I’ve been making the Mascarpone Brownies lately..they are SO good, but not much like a typical brownie..the texture is so tender. I imagine mascarpone cheese is more plentiful there; Yes/No? My favorite cheesecake is made with Mascarpone..so I imagine I could use it in this application. These look great. Have a great trip and a real hamburger! Its expensive in Canada too, 3.49 for one bar. Rarely it goes on sale for 1.99. I pick up bars in MI for 1.25 when I go. they keep for months. 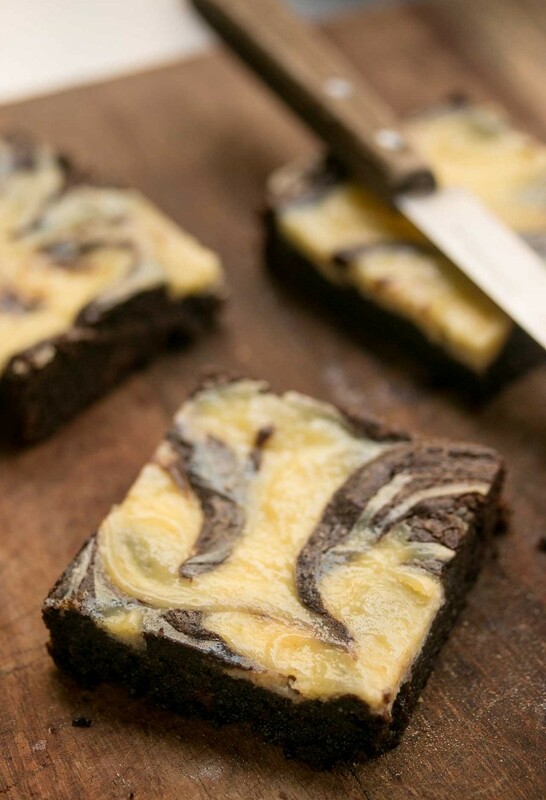 The cheesecake brownies look fabulous! I suppose, whenever I’m wishing I owned a little stone hut in Provence, I should remind myself that I could not buy cream cheese. Ha! Philadelphia cream cheese seems oh-so unclassy (ugh, those Canadian tv commercials with the angels make me want to punch someone…uncharitable, perhaps, but I can’t help it!) until you attempt to bake a cheesecake and suddenly appreciate that it costs a million dollars. I opt for the local cheese shops where you can buy housemade cream cheese from a big pail–it looks like pure heck, but they’ll weigh out the amount you need, there’s no wrapper to throw in the trash, and there is a lower water content, so the cake takes a shorter time to dry and turn firm, and rarely cracks when cooling. But I’m good with *any* excuse to take a dessert and make it into a brownie version! I therefore fully support this recipe and from now on, will pretend it is too pricey to make straight-up cheesecake, too. 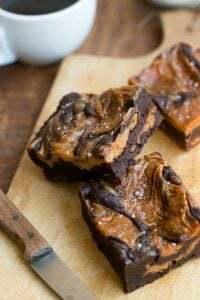 Brownies and cheesecake are not really my type of dessert, but after reading your recipe and saw how many different type of chocolate that you’ve put in the recipe, I think I would consider of trying it. Before I came to visit you today, I was over at Chocolate & Zucchini, reading about “fromage blanc” and “gateau a fromage blanc”, which sounds like Cheesecake Lite. I live in Small Town, Florida, nowhere near a Whole Foods, Trader Joe’s or the like. What would you (or your readers) suggest as a substitute for ‘fromage blanc’ if I wanted it to make a Tarte Flambe? 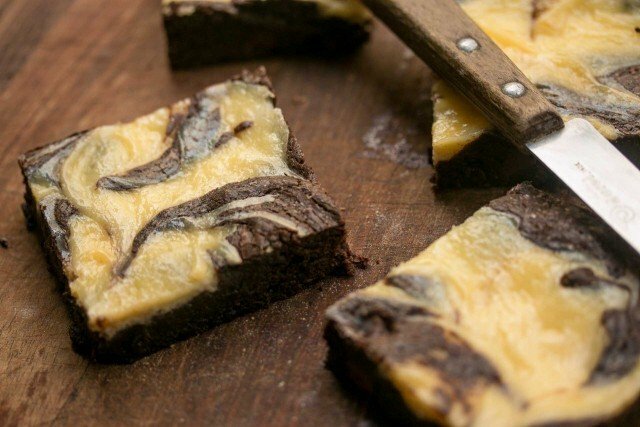 Seeing these lovely cheesecake brownies just knocked me over with a big wave of nostalgia. Growing up, I adored a less classy version of these treats at the cookie shop at the mall food court (you know, with the gigantic cookie cakes)? Anyway, it’s been ages since I’ve frequented the mall for dessert, but your post took me right back to scrunchies and En Vogue. :) Thanks! Fabulous photos! Of course I printed out the recipe…these will be perfect for a get together I’m planning for next weekend….and somehow the printer went crazy and printed 3 copies instead of one….but I’ll bet my friends will ask for the recipe, so I’m prepared! And for that last line, I think you meant to say they’ll FREEZE well. It looks so decadent… Wow! Do let us know indeed when the Bizarre Food episode will air, ok? Where will it be located? I would suggest you use sour cream, but the real thing, OK?, not the fat-free sour cream or other such non-sense. How can it be cream if it’s fat free? Good luck with tart flambee. It’s easy and yummy. Make sure you cook the onions on slow for a long time! I’ve been lurking here for a while, but never commenting. Then, this. In my 20’s, there was a shop near me called The Dessert Place, in Atlanta. A craving for the cream cheese brownie would get me on my bike riding 20 blocks for one. Record time. They closed unexpectedly, overnight, too fast for me to get the recipe. I’ll try this one and see if it can match a memory. I do make a cheesecake recipe I got years ago out of Gourmet, and take it to my local wineshop here in New Orleans. It’s amazing with wine, as it is cream cheese with Stilton. Enjoy that trip home; wish I was returning to France with you. I had a serious problem today. There was no dessert at my house. Then this post came up. I love cheesecake brownies. I love David Lebovitz recipes. I see a solution to my problem. Hi David, this is a really random question but I don’t know who else to ask. Do you know of any websites where I can download French music (that have a broader selection than itunes) without needing a French credit card? Neither French itunes nor fnac will let me buy music and I don’t know where else to look. Speaking of expensive…. many years ago someone working at the German embassy in Tokyo going back home wanted to make tiramisu for her colleagues and went shopping for some mascarpone – she got mascarpone but paid 72 German marks = 54,– US$ for the stuff…. Have a great time in S.F. and sorroundings… terrific spot on this planet!!!! Of course Paris, France is also nice…..
Can’t wait to try this recipe…of course that lonely egg white will come in handy for the banana cake recipe. What a lovely coincidence! I just found a cheap source of Philly cheese in Germany (I’m in Strasbourg), and was looking for just this kind of recipe. I’m a big fan of your site! Thanks for the great recipes. Brownie + Cheesecake! I love this combi. Both are my favs. Now mine is baking in the oven. I think mine will be gone before it went to the container. Just love your recipes!!! Thank you. Have fun on your trip, David! I’ve been promising a cheesecake to my french colleagues for years now, but the price tag on all that philly cream cheese has stopped me from doing it. But I am going to try these out on them next week and will be sure to report back. Brilliant! If I send you the forwarding address where I’ll be in Chicago for the next two weeks, will you send me a batch of brownies? Pretty please?? I love this entry ! That is so true, my boyfriend is french, and last year I introduced him to cheesecake and he now gets constant cravings for it, he absolutely LOVES it. Those look so good ! Bon voyage and have a great time in San Francisco ! That brownie cheesecake/cheesecake brownies reminded me of the recipe in The Rose Bakery Cookbook. It’s also very good, but I mixed the batters too much the first time and got a sort-of beige finished product. Do you like Rose Bakery? I’ve never seen it mentioned here. It’s one of my top 10 cookbooks of all time. Hi Folks: I arrived in SF (relatively) intact, and just in time for a Chinese noodle feast. Re the Bizarre Foods episode: Follow the link on my Schedule page. I don’t know when the show airs in various regions, but the link takes you to the site which I hope will say when it’ll be shown. My first tray is gone and my kids are asking for more. Now baking my second one. All give me a thumb up for this!!! Thank you. Ah ~ probably my favorite American classic. My friend and I used to bake brownies like this all the time while we were still in school. My chef and the rest of the students loved it. Happy travels in Sunny CA! Tell D&P I said Hello. Barbara: Oops! That’s what happens when I try to update blog while racing for a plane! Kira: You can use either here. 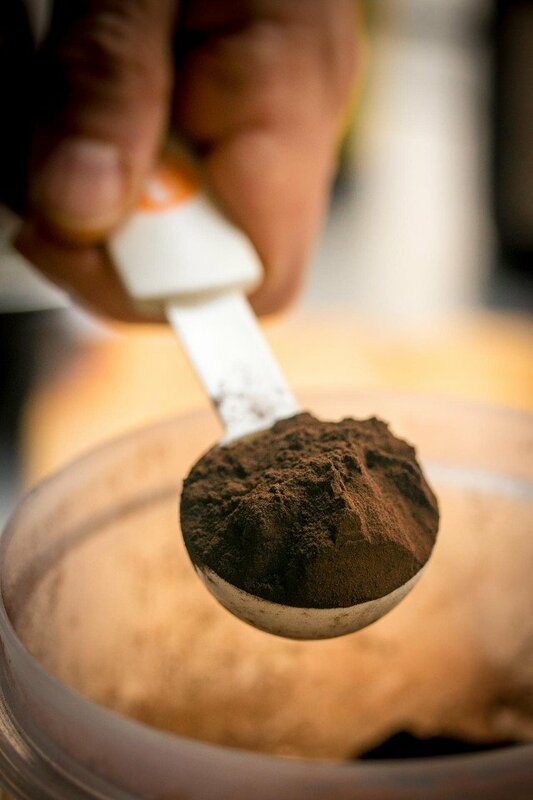 The extra bit of cocoa powder is to boost the chocolate flavor. I made Cheesecake Brownies, couple weeks ago, and we loved them. Beautiful pictures of your brownies. J’adore les brownies…. Il faudra que j’essaie ça à tout prix!! Ici au Québec, le fromage Philadelphia est un produit très répandu!! my mom makes a super delicious cheesecake with the german Quark and a bit of creme fraiche and sour cream or whipped cream. try it. amazing! Beautiful! Sounds really scrumpcious…something that I’ll be making sometime soon! Your pictures are beautiful, by the way! Why do you, with all your culinary talent, not make cream cheese at home?? Why do you rely on “Philadelpia” to make cream cheese full of gums and binders when making cream cheese at home is so easy, cheap and very tasty. Anything you buy in the market can easily be made at home and taste leagues better. Trust me with cream cheese….I’ve made cream cheese a few times…cow’s milk and goat’s milk. I learned the technique in Dairy Lab at Oregon State Univ. as part of the Food Science and Technology program. You need a good thermometer, fresh milk and a buttermilk or yogurt culture. This is a good challenge for you. From blanc recipes work well too. Your sly remark regarding Bridgette Palin make me laugh….you should team up with Berkeley Breathed, the pen behind “Opus”. Only an american will get your wry comments. Pia and biochemist: I did make my own Homemade Cottage Cheese a while back, and would love to give cream cheese a try. When I get home, I’ll look up a recipe for it and try to find the ingredients in Paris. I did a taste-test for a publication once on Philly vs. “natural” style cream cheese in cheesecake. The natural one got high marks on flavor, but folks preferred the smoothness of the regular cream cheese. Maybe my homemade will be the best of both worlds? Do you have any friends who own a restaurant? Philadelphia is not cheap in Singapore either, but when my dad is baking up a cheesecake storm (we used to be New Yorkers it happens that way sometimes) he calls up a friend of his here who owns a restaurant. His friend orders the Philly wholesale from a distributor and only charges my dad at cost. I know storing a case of cream cheese could be tricky in a Parisian sized apartment, but if you ever had a good reason to make multiple cakes it could work well. My dad never makes less than three at a time because they freeze so well, but I imagine your freezer is already full. I made these, and have to caution, they are very, very rich, and very sweet. Almost like fudge rich and sweet. A bit more than I usually like, actually, so I am cutting them in very small pieces. They are too much for my husband, so they are all mine. David! I am at the Marceau Bastille right this minute! Send some over! Wow this looks like bakery grade stuff that makes your sweet tooth ache and shocked that there was one left over. 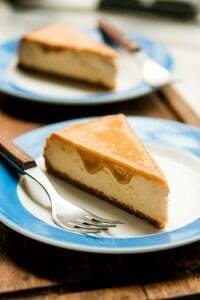 Can I add this to my site http://www.cheesecake-recipes.org Our visitors will definitely enjoy this great recipe. can not wait to come back from a wedding i’m going to tomorrow so I can make these and throw that stupid diet out the window! zena & la rêveuse: I’m not a fan of overly sweet desserts either. Rêveuse; You might want to make sure to use a fairly bitter chocolate. I tend to use one that’s around 50-55% cacao for testing since that’s around the norm. You could decrease the sugar in the cheesecake mixture to 1/4 cup, although when I tested that, I thought it might be too tangy or ‘cheesy’ for most tastes. 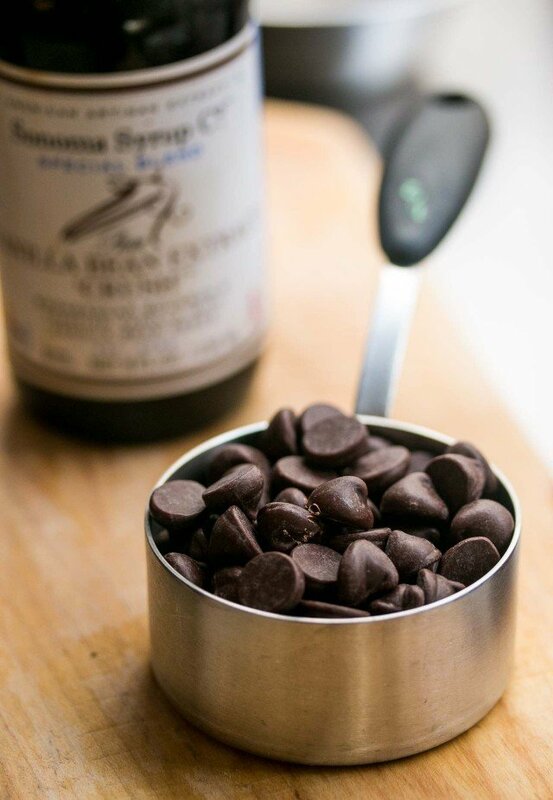 You could also decrease the sugar in the brownie batter by a few tablespoons, although they won’t be as moist. Samantha: Ever since I discovered the store-brand pâte à tartiner in France, I use that instead of Philadelphia. 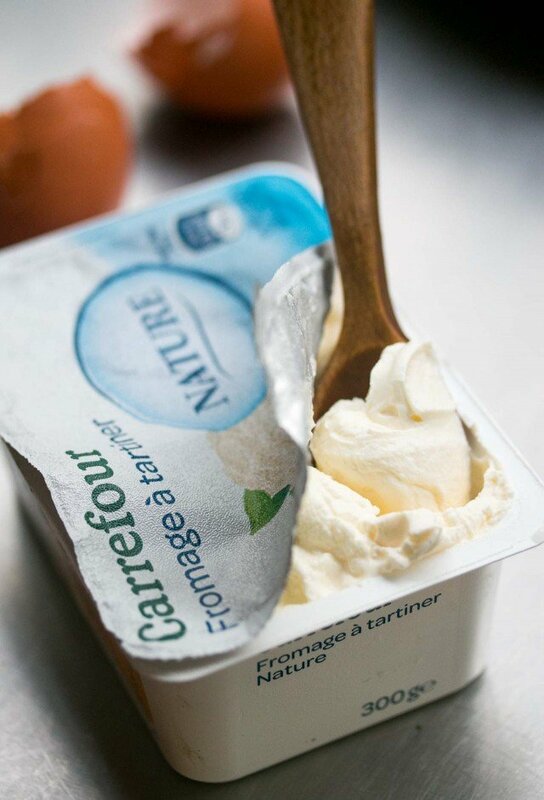 Also the Jewish grocers in the Marais carry cream cheese as well. But I did have a friend who brought me over a #5 brick of Philadelphia shortly after I moved to Paris, which was a great (but rich!) gift. I made it and it was delicious, David. Thank you!!! I guess I’m just a bad baker. Me again, with a novice question. When you say the brownies freeze well, do you mean cooked or uncooked? If it’s cooked, how do you thaw them? If it’s uncooked, do you thaw them before baking? I don’t often comment on people’s blogs, but I must admit, I couldn’t resist. As a young francophile who likes to cook, your blog is inspiring, informative, and fun. I just made chouquettes for the first time last week. I’m looking forward to future posts. Keep living the sweet life! ps-Have you tried Stumptown coffee? You should, if you haven’t. If you like coffee, that is! These brownies are the most amazing thing I have seen in weeks! Oh my word, these are amazing. I am amking them as soon as I can get to the store for the goods! Merci! David, just got home from a month in Paris. I met you at the Richard Lenoir market in Regis’ booth on the Sunday you helped him out. What a nice guy that Regis! He shared this Cheesecake Brownie with me and it was delicious. Gotta try this one! Philly Cream Cheese is pretty reasonable in Italy. I don’t know why and there are commercials for it on TV all the time. I made this for the Yom Kippur break fast. My friends and family enjoyed them immensely. Thanks for the recipe….it’s a keeper! Holy Carp! These were fantastic! They turned out woderful. Thanks for the recipe! They look delicious, will definately be trying the recipe. Just got around to making these – they were delicious. I’m not much of a baker, but this recipe was easy enough that the brownies were a huge hit with all who tried them. Thanks for the great recipe; I’ll definitely be using it again. And your recipes are great too. These brownies are totally awesome! They were such a hit at Thanksgiving today. Thank you for another fabulous recipe. This was easy and just so rich and delicious. They are all gone now! absolutely delicious and I used chocolate with 70% cacao….. Thank you for this wonderful recipe. To chime into the cream cheese discussion, I ended up using “Frischkäse Fass” from Aldi here in Germany. It worked perfectly! At least the cheesecake portion of these brownies. For some reason, my brownies were still runny in the middle, although I left them in the oven for almost an hour! I used a convection oven at 190 Celsius. Could the problem be that I used an 8×8 pan instead of a 9×9 pan? Please help, as I am really puzzled. Thank you so much for this recipe! I just finished making them and had the first bite–I tell you, it was a bit of a religious experience. Mmmmm! I just hope I can resist the rest, as these are for a friend’s dinner tonight. Also currently, there is a can of sweetened condensed milk, recklessly boiling away on my stove top because I am going to make your Dulce de Leches brownies next for a party on Sunday! Yummie! I made these for a huge French chocolate fanatic a week or so ago and they went over splendidly. I’m going to make them again for a dinner amongst friends this weekend. Can’t wait! By the way, I used the St. Moret from my local Monoprix, Dutch processed cocoa powder, and nearly 200g of chocolate, because chocolate chips are rather elusive in these parts. Thanks for posting this recipe. They came out really well! Wow, made these bad boys last night! They were delicious! Our users will definitely enjoy this great recipe. but yea.. thank you for posting this.. it doesn’t look exactly like dads, but I’m sure it’s just as awesome.. I’m going to make them tomorrow.. Thanks for the recipe David. I made these last night and while people enjoyed them, I didn’t get the nice marbling you got. The top was basically splodgy dark brown. Should I have turned off the heat coming from above, or put it lower inside the oven? It’s hard to say since so every oven is different. Some have intense heat on the top, others on the bottom. It sounds like yours is hot on top, so that was likely the problem. This is by far the best cream cheese brownie recipe I’ve tried. I brought them to a get-together and were a huge hit. Who knew cream cheese was so expensive overseas? I bought 3 eight ounce packages for $1. david! hi! seriously! this looks like heaven! tx for sharing!!! this was a great recipe. i made them exactly according to recipe and they were perfect for a sweet tooth chocolate lover such as myself. I cut them up into small squares as someone had suggested and they were perfect b/c i’d just eat one when wanting just a quick chocolate pick me up, or 3-4 small cubes for dessert after dinner. thanks for the great recipe and the awesome pics to go with! I’ve already printed the recipe out to make more for the family very soon. 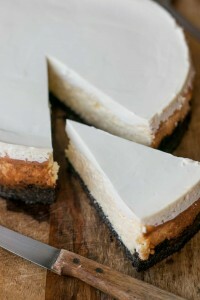 my mom (cough, cough, foodiesuz.wordpress.com cough) is a big fan of cheese cake and a big fan of coffee, do you have a recipe for a coffee cheese??? David, if I cannot get chocolate chips (yes, not available in Estonia, imagine:)), shall I just used chopped semi-sweet milk chocolate instead? Hi Pille; Yes, you can used chopped chocolate, but you might want to reduce the amount since chocolate chips don’t melt that well and chopped chocolate will melt slightly when baked this way. You might want to see if there is a restaurant or baking supply store where you live. Most bakeries have access to chocolate chips (like in Paris) but they’re hard to get in stores. I buy mine for €7/kg at G. Detou, which is a good price. Just made these yesterday. Looking at your photo, mine came out with a much more cheesecake-y texture than a brownie texture–very fudgy. I baked until set on top, but perhaps next time I’ll bake a wee bit longer, or maybe I got over zealous with the swirling! I used 60% chocolate and they were perfect (for those who are worrying that they are too sweet). Just made a batch of these and they’ve all gone already, family loved them – thanks for sharing! These are yummy. OK, they’re still in the oven, but it was yummy before I spread it in the pan. Since I ate about 10% of it before it went in the pan, I’ll knock 10% off the cooking time. Thanks for the recipe. Just stopping back by this post to let you know, David, that these are my go-to brownies and have many, many, many fans. Thanks again for posting them! Hello David..I am really excited to try these brownies for the up coming event. but i am confused a little as there is no baking powder in the ingrediants..
and secondly if i dont get semi sweet chocolate.. then what should i do..? cut down a lil bit of the amount of sugar in the recipe? Mrs. zeeshan: I’ve not made or seen many recipe for brownies that call for baking powder. And am not sure what to suggest if you can’t get chocolate since that’s an imperative component of the recipe. oh so it doesnt make any difference ritoo ? without baking powder. There are 2 large eggs, which are the 4th ingredient listed, which go into the chocolate mixture in Step #3. I was looking at this recipe and your devil’s food cake recipe as a possible base for a raspberry blanc-manger. Initially I considered a flourless chocolate cake (for the difference in texture and the crazy decadence), but the problem lies in how the chocolate base will survive out of the fridge and not at room temperature. Can you suggest anything? I’m going a little nuts and I’m running out of time. Thanks! Helen: You could certainly try this as a base, although since I haven’t used it myself, I can’t advise for sure. If you do try it, please let us know how it works out. This is sort of off topic now because in the end I made Chocolate Idiot’s Cake and a separate blanc-manger. I resisted the urge to layer the two and trotted them both to our friends’ house. Your words about the French being purists re: dessert kept floating through my mind, but baking is my new hobby and I’m Canadian so I compromised ;D. The cake was served at room temperature with a thin sliver of blanc-manger and raspberry sauce on the side. Your cake was amazing, super rich but so dreamy that we could still further stuff ourselves after Thanksgiving dinner! Thank you so much for taking the time to respond. I can’t wait until “Ready for Dessert” comes out next year. Hope you have a fabulous Thanksgiving in November. OMG, this is a seriously good recipe… I´m taking couple of pieces tomorrow to my office and I´m more than sure that my colleagues will love it. By the way, Philadelphia cheese is quite cheap in my country (Czech republic)… Something like 1 Euro per 125 grams. Merci beaucoup pour cette terrific recette !! Je l’ai essayée ce matin et c’est un franc (et américain) succès ! Saw it, made it, love it! Great blog. Tx. Mmmmmm!!! I’m serving these up at the company Christmas party…topped with fresh raspberries. I’ve made these 3 times so far, and made it part of my Christmas Goodie gifts to neighbors. They are roll your eyes food frenzy good! Have come back on a number of occasions to drool over these brownies and finally decided to make them last weekend. When they came out the oven they were inspected by the family who screwed up their noses, exclaiming “what are those?”. Told them to shut up and eat them. All I can say is when Monday came around there were only crumbs left in the box. Delicious! I have to vent a serious pet peeve here. After reading the comments on several recipes, I just can’t hold back. I sincerely wish people would not comment on a recipe they have not tried to make themselves. Asking a question about the recipe is fine but why do people post comments stating how good something looks? We all can see how good it looks. Thankfully, most of the posts on this recipe in particular are from those of us who have actually made the brownies. Speaking of which, I made these last night. They were good but I have never been a big cheesecake fan. I have to agree with the purists and keep my brownies pure only adding walnuts or pecans. I came across your website by accident browsing for some desert recipes online. Already by cooking once your cheesecake brownies and oatmeal raisin cookies was enough for me to stick to your cooking. Forget allrecipes.com and foodnetwork.com. David, your work is amazing!!!! Thank you for the wounderful recipes. Regarding the cream cheese brownies. I don’t understand what is the fuss in these comments about cream cheese. People, KRAFT is a world wide company and their Philadelphia is great for this recipe. The only thing I would suggest to the readers is to pay attention to the type of cholocate you add. David in his recipe mentions bitter sweet chocolate. The cooking chocolate I found here in Switzerland said “dark cooking chocolate”, was 46% cacao. The brownies were milk cholocolate color and not as dark as on the picture. I guess that next time I will look for chocolate with min. 70% cacoa. “Mist with non-stick spray” …. I’m wondering what this is called in France and where one might find it (“Le Pam”)? I’m not sure what it’s called in French, but in Paris, once can buy it at G. Detou. If unavailable, one can grease the foil using a brush. Lovely and ever-so bittersweet. Made these today on a whim, I do so love my whims, and they came out perfect. Now I just need some cornish vanilla ice cream and we are talking! Thanks for the recipe. p.s I so wish that shop G. Detou was online as I would order the stuff for delivery here in the UK. Thank you very much for the recipe. The cheesecake top came out perfect but my brownie was very fudgy, almost like truffles. I used Sharffen Berger’s 99% Unsweetened Chocolate. Could this be the problem? Please advise. I would like to double the recipe. Which size pan should i use? I’ve not done that, but would suggest baking it in two pans, following the instructions. Thanks for the recipe! I felt my brownies are a tad dry..not moist. Anything I did wrongly that may caused that? Any tips on what I should do if I want a bit more moist in my brownie? If they are dry, they were likely cooked too long. To make them moister, in the future, you can add a few additional egg yolks to the chocolate batter. This is such a wonderful recipe. I’ve made it many times now and it always disappears lightning fast…Sometimes before I even have a chance to serve it to guests! Thank you for sharing it! My brownie came out very moist and fudgy. I baked it for as long as the recipe called for. What could I have done wrong? I have my own personal brownie recipe that I never stray from, however after finding this one I decided to give it a shot, and it is just as good if not better than my usual one! Absolutely delicious! In regards to the last post – I LOVE moist and fudgy brownies over cake-like ones. Thanks so much for the interesting recipe. They’re done and fab :) the brownie is very soft and my swirls weren’t as distinct as yours. Delicious. I’m going to take it with me to a dinner I have been invited to tomorrow. Thanks again for sharing your lovely recipes. Thanks David! another wonderful recipe, I made the brownies with and without the cheese part and I’m saying goodbye to my 15 year old brownie recipe because this one is so much better, love it! Looks so delicious. Going to bake these this weekend. My husband is on a diet so more for me! As an American living in Germany, I thought this would be a great way to bring two American classics to my German friends. They all loved it and requested the recipe. It was so simple and I definitely recommend trying it. Would neuchatel (think this is the spelling) be an affordable switch for Philly. Neuchatel is low fat too. I just made these and the brownies didn’t come out as dark as the picture above but mine wasn’t that sweet. I used Ghirardelli bittersweet chocolate bar (60%) and Hershey’s unsweetened cocoa powder and semi-sweet chocolate chips. Is it because of the kind of chocolate I used? Jules: I don’t know if neufchatel is much more affordable than regular cream cheese, but if you give it a go, please let me know how it works out. However, your recipe does not include the stirring vigorously for 1 minute after incorporating the flour. Does this make a difference? Is it not necessary because of the cheesecake topping? If I did it anyway, would it hurt? My batch of these brownies are in the oven. !!!! I used black cocoa powder that I had on hand, and put in orange extract. They smell amazing, and I can’t wait to try them. Thank you for all of your recipes, they’re fantastic! I made these for the first time last week and loved them. One question: will there be a marked difference between using original cream cheese and light cream cheese?